I'm still learning the enhanced features of the new BibleWorks8, but if you are upgrading from BW7, there is really no additional learning curve to use the program. It's mainly providing enhancements, more tools, and more resources. But in the meantime, the indefatigable Michael Hanel has updated and improved some user-created databases. Sophocles in Greek and Tacitus in Latin and English: These were already available and the previous versions worked fine in BW7. Because of some naming changes, these are updates for BW8, and you should also grab the names file on the page as well. “Improving the ESV: Why the English Standard Version (ESV) Should not become the Standard English Version” a paper by Mark Strauss read at ETS: Richard Sugg took this paper and created a BW module which is now hosted on the BibleWorks blog. This paper generated a fair amount of discussion on the blogosphere. [BWBlog: For more on Strauss’s paper see his blog post at Koinonia as well as Bill Mounce’s response. See also Strauss’s paper as posted on the Better Bibles Blog (and the comments thereon).] 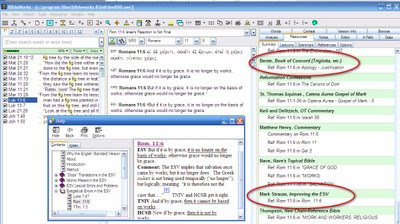 Like the Book of Concord module above, what's so helpful about this module is that it is able to link the many Scripture references in the paper to the texts in BW so that they are just a mouse hover or click away. It also works in reverse, so that if you are reading a biblical text that is mentioned in the paper, a link to it will show in the Resource Summary List. Thanks to both Michael Hanel and Richard Sugg for sharing these resources.